Profit Taking With The Eliot Waves Theory. learnsteemCreated with Sketch. Elliott Wave Theory was developed by R.N. Elliott and popularized by Robert Prechter. This theory asserts that crowd behavior ebbs and flows in clear trends. Based on this ebb and flow, Elliott identified a certain structure to price movements in the financial markets. The article serves as a basic introduction to Elliott Wave Theory. 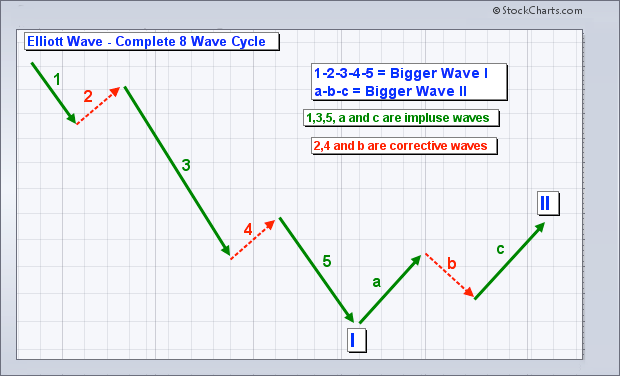 A basic 5-wave impulse sequence and 3-wave corrective sequence are explained. While Elliott Wave Theory gets much more complicated than this 5-3 combination, this article will only focus on the very basics. The labeling convention shown above is a hybrid between that shown in the Elliott Wave book and the Elliott tools from SharpCharts. In Elliott-speak, this labeling convention is used to identify the degree or level of the wave, which represents the size of the underlying trend. The upper case Roman numerals represent the large degree waves, the simple numbers represent the medium degree waves and the small-case Roman numerals represent the small degree waves. The trends start with the largest degree (Grand Supercycle) and work their way down to waves of lesser degree. For example, the Cycle wave is one larger degree than the Primary wave. Conversely, the Primary wave is one lesser degree than the Cycle wave. Wave 1 of (1) would indicate that Wave 1 is part of a larger degree Wave (1). Wave 1 is a lesser degree than Wave (1). In reality, most chartists will only use 1 to 3 wave degrees on their charts. It can get quite complicated trying to apply nine Wave degrees or even just using the labeling convention in the order provided. 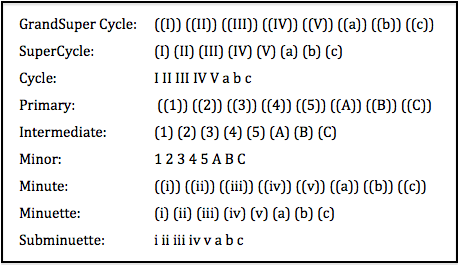 Chartists using 1 to 3 wave degrees can simply label the highest degree waves with upper case Roman numerals (I,II,III,IV,V,a,b,c), the middle degree waves with numbers (1,2,3,4,5,A,B,C) and the lowest degree waves with lower case Roman numerals (i,ii,iii,iv,v,a.b,c). This provides three distinct groups for labeling various waves. There are two types of waves: impulse and corrective. Impulse waves move in the direction of the larger degree wave. When the larger degree wave is up, advancing waves are impulsive and declining waves are corrective. 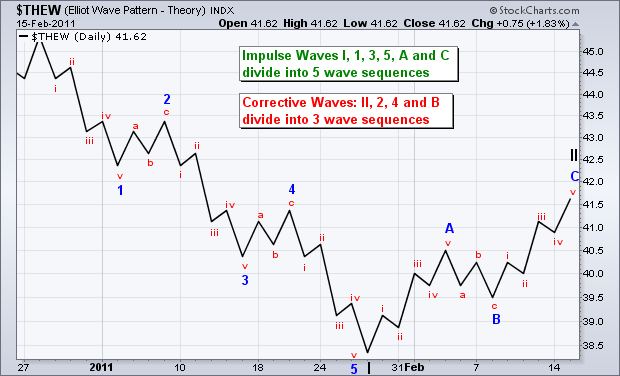 When the larger degree wave is down, impulse waves are down and corrective waves are up. Impulse waves, also called motive waves, move with the bigger trend or larger degree wave. Corrective waves move against the larger degree wave. The chart above shows a rising 5-wave sequence. The entire wave is up as it moves from the lower left to the upper right of the chart. Waves 1,3 and 5 are impulse waves because they move with the trend. 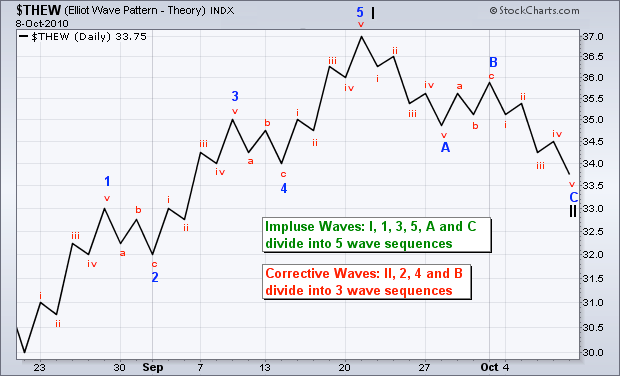 Waves 2 and 4 are corrective waves because they move against this bigger trend. A basic impulse advance forms a 5-wave sequence. 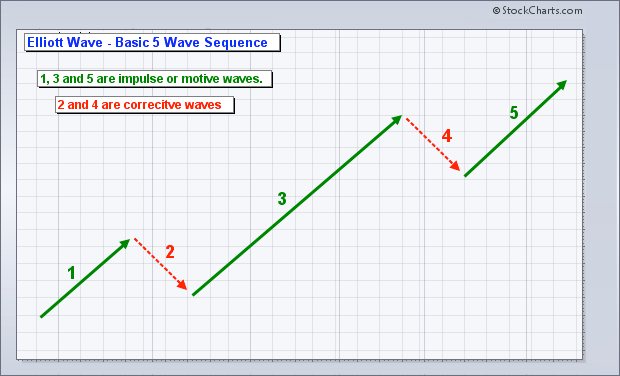 A basic corrective wave forms with three waves, typically a, b and c. The chart below shows an abc corrective sequence. Notice that waves a and c are impulse waves (green). This is because they are in the direction of the larger degree wave. This entire move is clearly down, which represents the larger degree wave. Waves a and c move with the larger degree wave and are therefore impulse waves. Wave b, on the other hand, moves against the larger degree wave and is a corrective wave (red). Combining a basic 5 wave impulse sequence with a basic 3 wave corrective sequence yields a complete Elliott Wave sequence, which is a total of 8 waves. According to Elliott, this complete sequence is divided into two distinct phases: the impulse phase and the corrective phase. 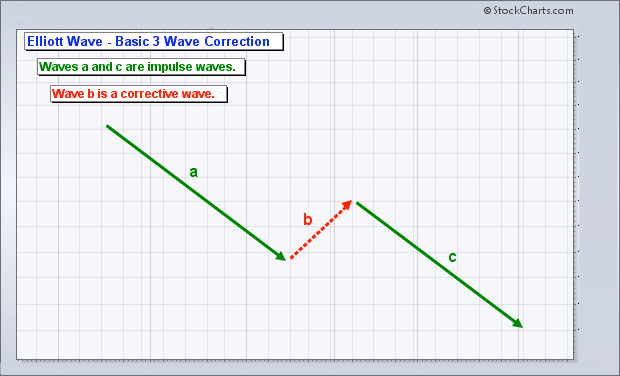 The abc corrective phase represents a correction of the larger impulse phase. These 8-wave charts show two larger degree waves (I and II) as well as the lesser degree waves within these larger degree waves. Waves 1-2-3-4-5 are one lesser degree than Wave I. By extension, Wave I is one larger degree than Waves 1-2-3-4-5. Waves a-b-c are one lesser degree than Wave II. Elliott Wave is fractal. This means that wave structure for the GrandSuper Cycle is the same as for the minuette. No matter how big or small the wave degree, impulse waves take on a 5-wave sequence and corrective waves take on a 3-wave sequence. Any impulse wave subdivides into 5 smaller waves. Any corrective wave subdivides into three smaller waves. The charts below show the fractal nature of Elliott Wave in action. Believe it or not, there are only three rules when it comes to interpreting Elliott Wave. There are many guidelines, but only three HARD rules. These are unbreakable. Guidelines, on the other hand, are bendable and subject to interpretation. Furthermore, these rules only apply to a 5-wave impulse sequence. Correction, which are much more complicated, are given more leeway when it comes to interpretation. Wave 2 cannot move below the low of Wave 1. A break below this low would call for a re-count. Even though Wave 3 is typically the longest of the three impulse waves, there is a specific rule that it cannot be the shortest. 1 or 5 can be longer than Wave 3, but both cannot be longer than Wave 3. It is probably best to use percentages or log scales when measuring Wave length. Elliott Wave indicates that Wave 3 must exceed the high of Wave 1. Failure to exceed this high would call for a re-count. Impulse moves are all about making progress. Failure to exceed the high of Wave 2 would not be making progress. The third, and final rule, is that Wave 4 cannot overlap Wave 1, which means the low of Wave 4 cannot exceed the high of Wave 1. Such a violation would call for a re-count. There are numerous guidelines, but this article will focus on three key guidelines. In contrast to rules, guidelines should hold true most of the time, not necessarily all of the time. 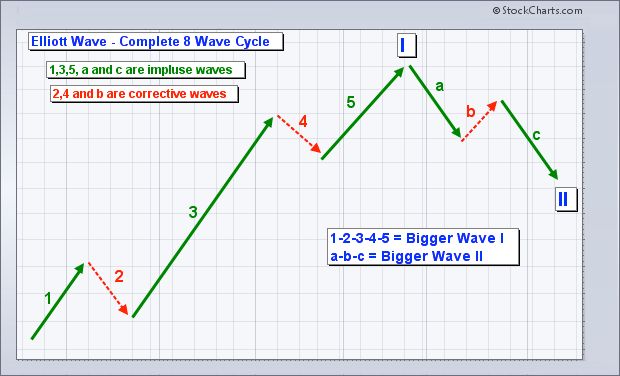 Guideline 1: When Wave 3 is the longest impulse wave, Wave 5 will approximately equal Wave 1. Guideline 2: The forms for Wave 2 and Wave 4 will alternate. If Wave 2 is a sharp correction, Wave 4 will be a flat correction. If Wave 2 is flat, Wave 4 will be sharp. 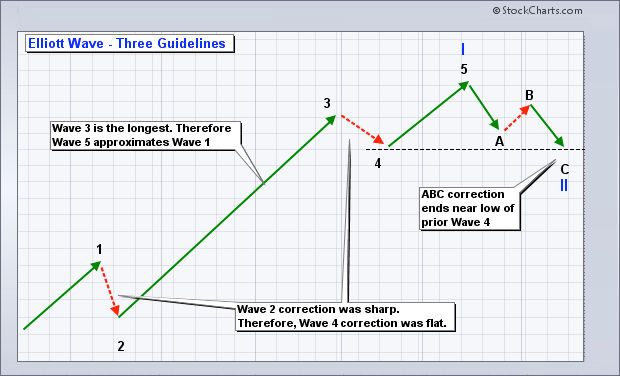 Guideline 3: After a 5-wave impulse advance, corrections (abc) usually end in the area of prior Wave 4 low. The first guideline is useful for targeting the end of Wave 5. Even though Wave 5 could be longer than Wave 3 and Wave 3 could still be longer than Wave 1, chartists can make initial Wave 5 projections once Wave 4 ends. In a larger uptrend, chartists simply apply the length of Wave 1 (percentage change) to the low of Wave 4 for an upside target. The opposite is true for a 5-wave decline. 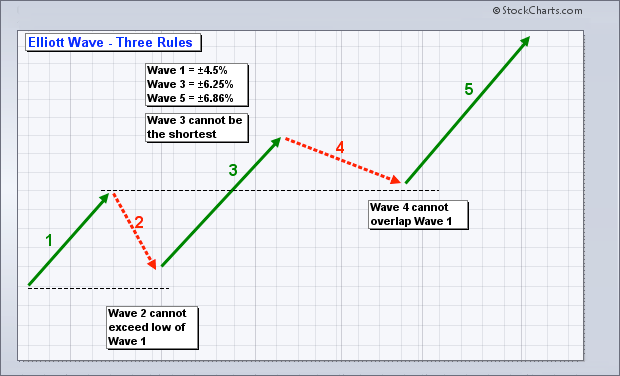 The percentage decline in Wave 1 would be applied to the high of Wave 4 for a Wave 5 estimate. The guideline of alternation (2) is useful for determining the time of correction for Wave 4. After a sharp decline for Wave 2, chartists can expect a relatively flat correction for Wave 4. If Wave 2 is relatively flat, then chartists can expect a relatively sharp Wave 4. In practice, Wave 2 tends to be a rather sharp wave that retraces a large portion of Wave 1. Wave 4 comes after an extended Wave 3. This Wave 4 marks more of a consolidation that lays the groundwork for a Wave 5 trend resumption. The third guideline is useful for estimating the end of a Wave II correction after a Wave I advance. Waves I and II are the larger degree waves. Waves 1-2-3-4-5 are lesser degree waves within Wave I. Once the Wave II correction unfolds, chartists can estimate its end by looking at the end of the prior wave 4 (lesser degree wave 4). In a larger degree uptrend, Wave II would be expected to bottom near the low of lesser degree Wave 4. In a larger degree downtrend, Wave II would be expected to peak near the high of lesser degree Wave 4. Even though this article just scratches the surface of Elliott Wave Theory, chartists can greatly improve their counting by applying the three rules and three guidelines listed. Elliott Wave counts start with a process of elimination. Apply the rules for the first count attempt and then the guidelines on the second. Eliminating bogus counts paves the way to a more accurate count. Even with accurate counts, chartists will still need to re-evaluate and adjust counts as new price information emerges. It is just the nature of the beast. You can use our Chart Notes annotation tool to add Elliott Wave notations to your charts. Below, you'll find an example of a chart annotated with Elliott Wave notations. There will be more bungholes after me! damn - would have been so nice if this post was original! Just taking this opportunity to say "THANK YOU FOR FOLLOWING ME"